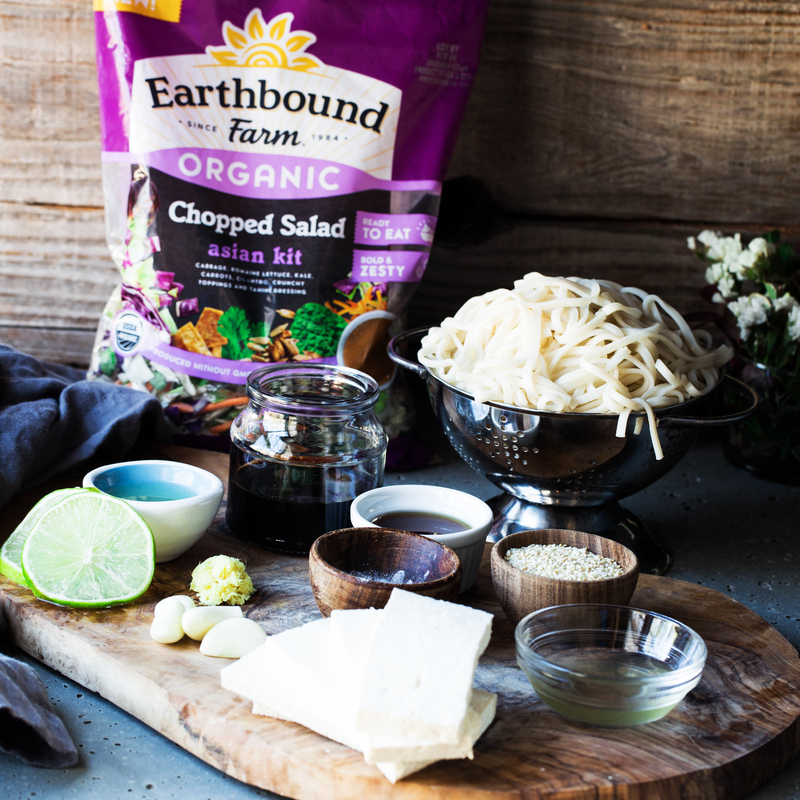 This powerfully delicious and nutritionally balanced bowl of goodness was as simple to make as adding a bit of carb and protein to an already yummy salad, thanks to the Earthbound Farm Asian Chopped Salad Kit. The salad already came with a fresh mix of organic kale, lettuce, cabbage, carrots and cilantro, along with a vegan tahini dressing, sunflower seeds and crunchy toppings. Most of you in the US are already familiar with the Earthbound Farm as their fresh organic greens are widely available in the grocery stores. I love that they started out so small, with 2.5 acres of farmland in the Carmel Valley of California, and they grew big through their big commitment to organic farming. Through TheFeedFeed, I was excited to discover that they are expanding their product line with organic chopped salad kits now, complete with dressings and toppings. And what more, out of the three kits they are introducing, one is vegan and it is delicious! The dressing in the Asian chopped salad kit is worth drooling about a little. Well it is called tahini dressing, and I am already sold! But they added soy sauce, cane sugar, vinegar, garlic and ginger to truly infuse it with an Asian flare and it totally works. I chose to pair the salad mix with some udon noodles because they are super quick and easy to make, and I can never have enough noodles. And I thought a well seasoned tofu was a great match for the added protein. I am sure I have said this before somewhere but I think tofu is a blank canvas, waiting to soak up flavors. The flavor of choice, this time, was also Asian inspired. I used components like maple syrup, garlic, ginger, soy sauce, apple cider vinegar and lime juice to create a glaze that would have great coating qualities. Sprinkled with sesame seeds for added taste and texture, the tofu was transformed into a treat! While I used the Asian Kit in this recipe, they also make the kits in Southwest and BBQ Ranch - however, the Asian Kit is the only one that is vegan. Mix the noodles with the salad kit contents, including the sunflower seeds and the tahini sauce that comes with it. Save the crunchy toppings for serving. Cook until the sauce starts to thicken and get sticky, about 1-2 minutes. Flip the tofu steaks, sprinkle with the sesame seeds and cook another minute, or until the sauce has the desired consistency. Keep in mind that the sauce will thicken further as it cools down. Flip the steaks and make sure they are well coated with the glazing. 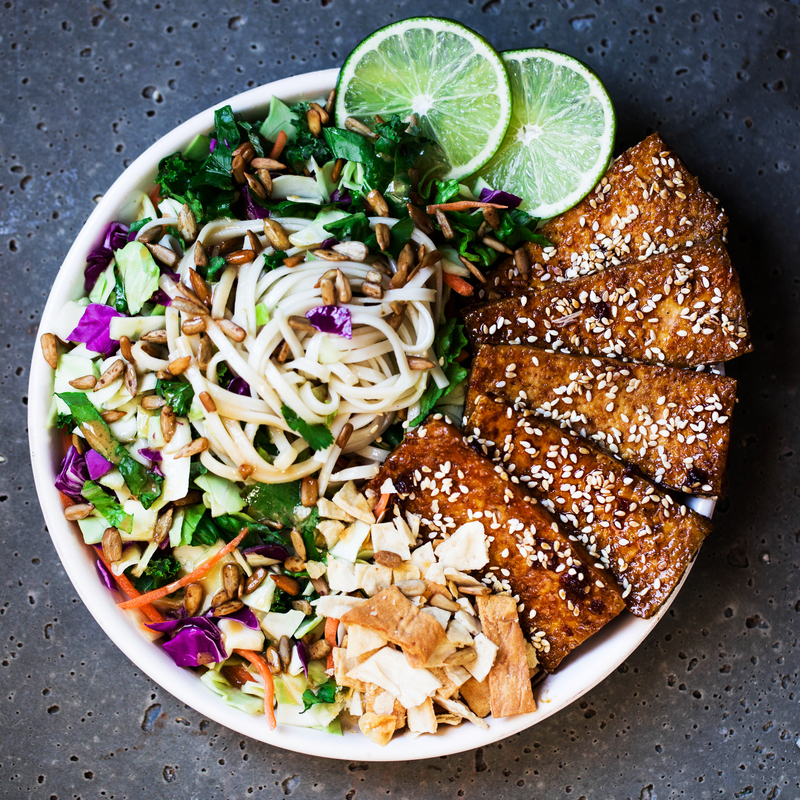 Plate the tofu steaks as a side to the noodle salad, top with the crunchy toppings from the salad kit.